Here's a preliminary group of FD pix courtesy of Ben VA3BNY. The scores and a story to follow. 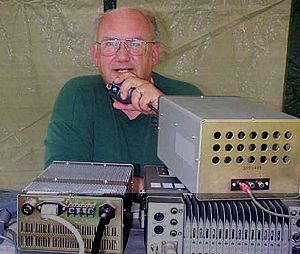 We operated 160/80SSB, 40CW, 40SSB, 20CW, 15CW, 10SSB 10CW 6SSB. An even split between Phone and CW. 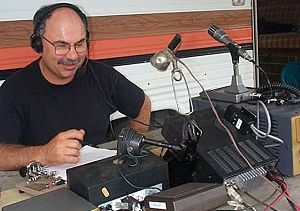 Our new President, Bob VA3MCK was visiting his son in Nanaimo BC over the FD weekend and filed a report for us. Click here for his story. 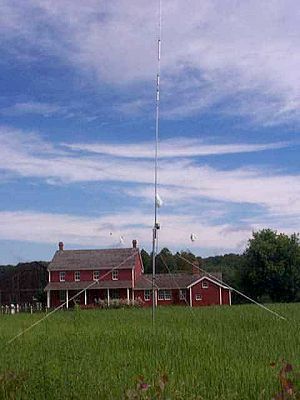 The above picture is a great depiction of our setting with the 10 metre CW verticle in the field in front of a circa 1800 farm house beautifully restored at the Doon Heritage Crossroad. 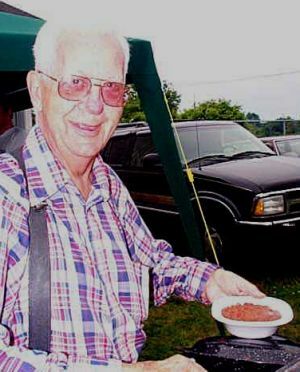 Every year the Saturday evening meal has always featured a great pot of "home-Brew" chili from the Kitchen of Huby and Eileen Stumpf. 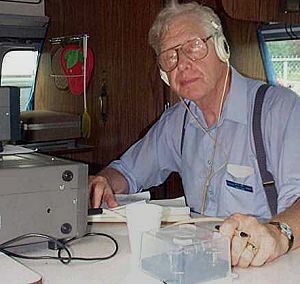 VE3SY operated from the rear of his mini van and wondered why he had no visitors during the evening. 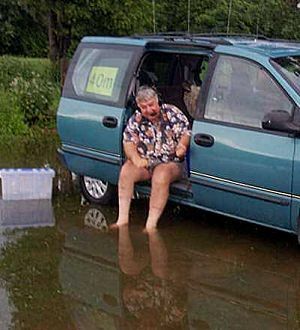 Waterloo Region was deluged during the evening with up to 4 inches of rain much of which surrounded Paul's van. The only way out of or into 40SSB for the balance of the day was in bare feet. 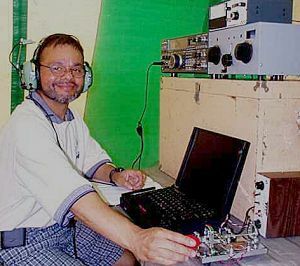 40 CW was operated by Jon VE3CBX. 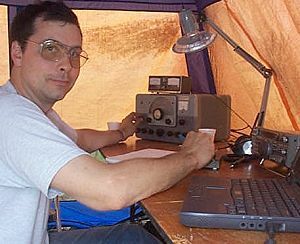 15 CW (no pic) was operated by Iulian Rosu VA3IUL. 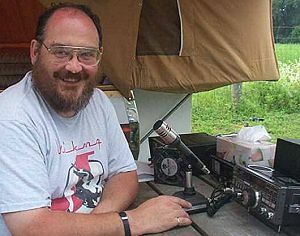 10 metre SSB was kept alive by John VE3SJVwith his Kenwood TS440. 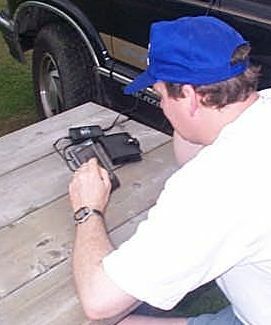 FD coordinator Dave VA3DGS is shown here working VA3RAC (operating 35A in Ottawa) using his Palm Pilot connected to his mobile TNC. 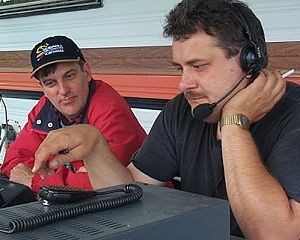 The hub of our FD site and the most important fixture for Field Day 2000 was the portable crank-up tower owned by Ben VA3BNY. 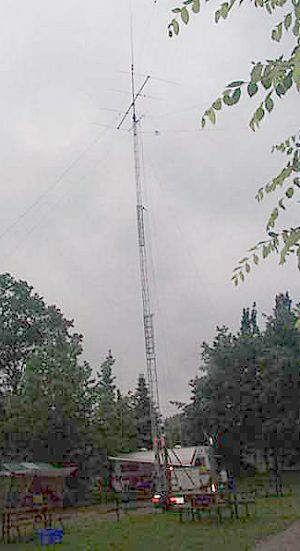 The tower is easily trailered and can be erected up to 50 feet with about 5,000 hand cranks of the hand winch. If anyone has a 12 volt winch motor that they wish to part with Ben will be grateful. On top was a verticle for 10 then the 6 metre beam. Below the beam were the mooring points for numerous dipoles. No we did not set up at night only to realize 10CW was on train tracks. 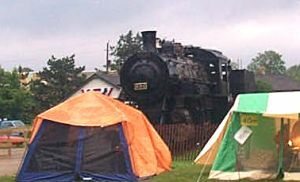 This old steamer is part of a static railroad display that includes the original Petersburg Train Station. There is an energetic restoration program in place for the locomotive that has been deteriorating due to rust.